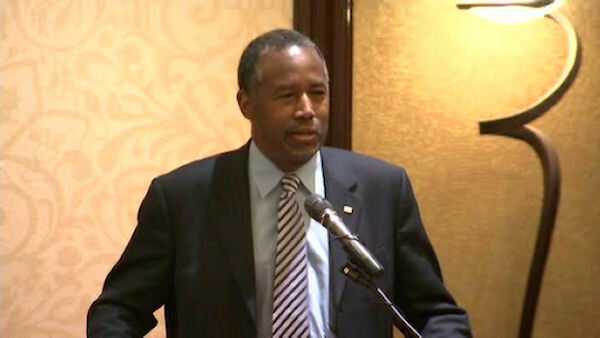 BLOOMFIELD, Staten Island (WABC) -- In the race for the White House, Ben Carson was in New York City Monday night trying to get his struggling campaign back on track. The one-time republican front-runner hosted a town hall meeting in Bloomfield, Staten Island. Last week, his campaign suffered a big shake-up when three top staffers resigned after questioning Carson's readiness for the presidency. Carson said he's not rattled by the shake-up. "People are always saying, don't listen to the media, don't listen to the pundits, please don't give up, you know, you don't have to worry about that. I'm not even thinking about giving up, clearly," Carson said.